Durable Medical Equipment (DME) is a piece of equipment that you can use in your home. It’s something that helps make life easier when you have a medical condition. Wheelchairs and hospital beds are examples of DME. I have Medicaid and I need a piece of durable medical equipment. How do I get it? 1. Ask your doctor or health care provider to refer you to an evaluator for an assessment. Most evaluators are physical or occupational therapists. The evaluator will set up an assessment with you. You might have to wait for the assessment if the evaluator is very busy. You might also have to wait if the DME vendor needs to help you try the equipment. The DME vendor is the company that provides the equipment. The evaluator will decide what kind of DME you need and send an assessment form to your doctor or health care provider. You might not need an assessment if the DME that you need is simple. If your doctor or health care provider says you do not need an assessment, skip to step 2. 2. Your doctor or health care provider will write a prescription. They will sign the assessment form and send a prescription for the DME to the vendor. 3. The DME vendor will ask Medicaid for prior authorization. 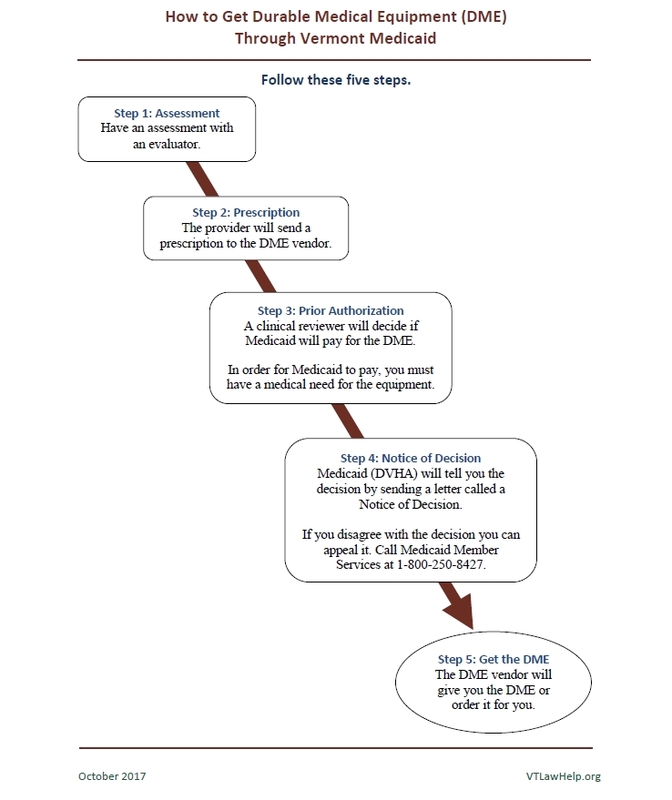 If your medical provider tells you that you do NOT need prior authorization, skip to step 5. Prior authorization means that Medicaid has to say it is okay before you can get the equipment. In many cases you will need prior authorization. If you need prior authorization for the DME, the vendor will send information to Medicaid about you and the DME that you need. A clinical reviewer at Medicaid will review your information. The reviewer will decide if you have a medical need for the equipment. The clinical reviewer might need more information to decide if you have a medical need for the equipment. If the reviewer needs more information, Medicaid will ask the DME vendor to send it. The vendor must send the information within 12 days. Once Medicaid has all the information it needs, the reviewer must make a decision within three business days. 4. Medicaid will send you a Notice of Decision. Medicaid will give you a decision by sending you a letter called a Notice of Decision. Medicaid will also send the letter to your doctor or health care provider and the DME vendor. In Vermont, the Department of Vermont Health Access runs Medicaid, so the letters will be from that department. 5. The DME vendor will get the DME for you. If Medicaid approves, the DME vendor will give you the DME or order it for you. If Medicaid does not approve, you can file an appeal. If Medicaid does NOT approve, you can disagree with the decision by filing an appeal. To file an appeal, call Medicaid Member Services at 1-800-250-8427.